WOMAN IN GOLD presents the true story of Maria Altman (Helen Mirren), a Jewish Austrian who fled Vienna as the Nazi’s took control. Austria, overwhelmed by the Nazi invasion, saw the reign of terror against the Jewish population begin. As we now know, Nazi’s pillaged the country stealing art and personal belongings as they went. Gustav Klimt’s masterpiece painting Portrait of Adele Bloch-Bauer I – a portrait of Maria’s beloved aunt – was stolen from her family, along with many of their most cherished possessions. The masterpiece hung in the Austrian State Gallery for decades. In the late 90’s, Maria is living in Los Angeles. When her only living relative – her sister – dies, Maria is desperate to keep the memory of her family alive and sets out to reclaim the masterpiece painting that hung in her childhood home. She hires rookie lawyer Randy Schoenberg (Ryan Reynolds) who can barely keep a job while managing his growing family. But their connection is, like the painting, a relic of the old world. Schoenberg’s family, too, was uprooted from Austria during World War II (his grandfather is the famous composer by the same name). The history they share is profound, but their personal relationship is uneasy. Maria is bossy and shows little regard for Schoenberg’s personal needs. He’s wrapped up in his own career and is reluctant to take on the case – until he finds out the painting is worth more than $100 million dollars. And just like that, his interest is piqued, and a trip to Austria to work with the museum is in order. For Maria to travel to Austria, she must confront the nightmares of her past, which moviegoers experience through her flashbacks. The conflict is framed like a David vs. Goliath tale – two Americans taking on the Austrian government, which is trying to protect what has become a cultural icon in their country’s history. The painting is often referred to as the Mona Lisa of Vienna. But unfortunately, the movie loses focus. Between flashbacks, courtroom battles, Schoenberg’s discovery of his own Austrian heritage, Schoenberg’s personal life, and Maria’s haunted past, the story is just too aimless. In an effort to do too much at once, the film does not do any one thing very well. The end product looks like they bit off more than they could chew. Of anything in the movie, the World War II flashbacks are the most captivating. Director Simon Curtis (MY WEEKEND WITH MARILYN) does his best to add a gripping element to the film through Maria’s backstory. Too bad they didn’t add the same excitement to the legal battle and courtroom scenes. The stark contrast between the past and present add to the disjointed feel of the story – with flashbacks sprinkled in to save the lagging momentum of the rest of the film. Mirren does her best to give the movie the depth it desperately needs and she delivers a top-notch performance. Unfortunately, she's up against too many aspects of poor filmmaking to overcome: editing, writing, pacing, fellow actors and so on, although Ryan Reynolds is fine as the quiet, kind of nerdy, barely-has-a-grasp-on-law character. 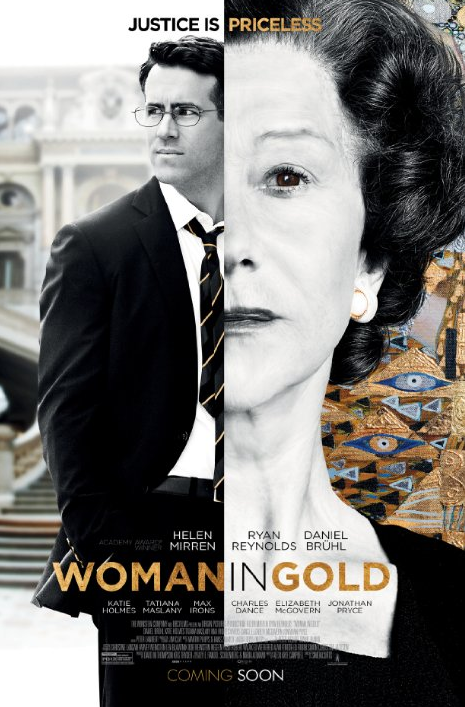 WOMAN IN GOLD feels a bit like a kindred spirit to PHILOMENA (2013), an excellent film that also follows an older woman on her journey to reclaim something from her past while accompanied by a fairly unsympathetic younger man. Aspects of these real-life stories at times run parallel, but WOMAN IN GOLD simply lacks the depth and connective feel of PHILOMENA.